There were 164 press releases posted in the last 24 hours and 153,359 in the last 365 days. NEW HAVEN, CONNECTICUT, UNITED STATES, May 17, 2017 /EINPresswire.com/ -- Acclaimed country singer and songwriter Martina McBride lends her voice to encourage parents and caregivers to turn the routine moment of “diaper time” into special opportunities to smile, sing, talk, and bond with their infants and toddlers. 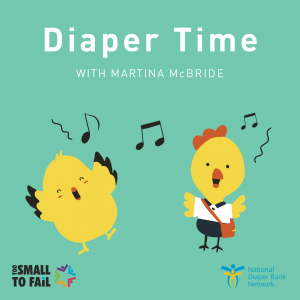 In the first-ever "Diaper Time" playlist featured on Spotify, Kids and Family (spotify.com/sing), McBride delivers a series of tips and activity ideas between songs aimed at inspiring parents to make diaper changing time a moment to meaningfully interact and promote their child’s early language and brain development. Given her passion for family and music, McBride generously volunteered her time to record the audio prompts for the "Diaper Time" playlist curated in partnership with Too Small to Fail, a joint initiative of the Clinton Foundation and The Opportunity Institute, that empowers parents with tools to talk, read, and sing with their children from birth, and the National Diaper Bank Network, a nonprofit dedicated to helping struggling families access clean diapers for their children. This effort is in support of Too Small to Fail and the National Diaper Bank Network’s partnership to distribute early literacy tips and resources to parents through diaper banks nationwide—currently available at nationaldiaperbanknetwork.org/diapertimetalktime. This new collaboration with McBride and her Team Music Is Love charity initiative leverages her ability and desire to bring people together to do good through the power of music. • Did you know? Simple actions like talking, reading, and singing with your children—right from the start—can build their brains and prepare them for success in school and beyond. • In my daughter’s eyes, I am a hero. And so are you! Did you know your face is one of her favorite toys? Make silly faces as you change her diaper and see if she will imitate you. • Your loving gaze lets your baby know how much you care. Make eye contact as you sing together! You can sing “Heads, Shoulders, Knees, and Toes” as you point to parts of your baby’s body or make up a new song! • Changing your little one’s diaper is a special time where you can talk, bond, and sing together. But did you know that 1 in 3 American families struggle to afford diapers? • Play peek-a-boo when changing your baby’s diaper. Make it fun and silly by showing different feelings with your face and labeling them with words happy, excited, or surprised. This helps support your baby’s social and emotional development. McBride resides in Nashville with her husband, John, and their three daughters. Keep up to date on her activities on Facebook, Twitter, and Instagram. About Martina McBride: Multiple Grammy® nominee Martina McBride has sold over 18 million albums to date, which includes 20 Top 10 singles and six #1 hits. 2017 marks a milestone in Martina’s illustrious career – it is her 25th year of touring. She can currently be found touring North America on the LOVE UNLEASHED TOUR. April 2016 Martina released RECKLESS, her thirteenth studio album. McBride has earned more than 15 major music awards, including four wins for Female Vocalist of the Year from the Country Music Association and won three Academy of Country Music for Top Female Vocalist. Martina has been awarded 14 Gold Records. Martina was awarded the Covenant House Beacon of Hope Award and Music Business Association’s prestigious 2015 Harry Chapin Memorial Humanitarian Award for her philanthropic efforts on behalf of domestic violence. Through her Team Music Is Love charity initiative, Martina partners with non-profit causes to help many of the towns she's performing in. Since 2011, Team Music Is Love has been responsible for many successful fundraising and volunteer projects helping causes such as hunger relief, cancer research, combating domestic violence and helping children in need. For more information, please visit TeamMusicIsLove.com. About Too Small to Fail: Too Small to Fail, a joint initiative of the Clinton Foundation and The Opportunity Institute, is leading a public awareness and action campaign to promote the importance of early brain and language development and to empower parents with tools to talk, read, and sing with their young children from birth. Too Small to Fail aims to make small moments big by creating opportunities for meaningful interactions anytime, anywhere. About the National Diaper Bank Network: The National Diaper Bank Network (NDBN) is a nationwide nonprofit dedicated to eliminating diaper need in America, by leading a national movement to help meet the basic needs of all babies and their families…including access to clean, dry diapers, and other material goods. More information on NDBN and diaper need is available at www.nationaldiaperbanknetwork.org, and on Twitter (@DiaperNetwork) and Facebook (facebook.com/NationalDiaperBankNetwork).